On Tuesday, May 19th, 2015, the Plains All American Pipeline spilled more than 140,000 gallons of heavy crude from an underground pipeline on the Gaviota Coast. 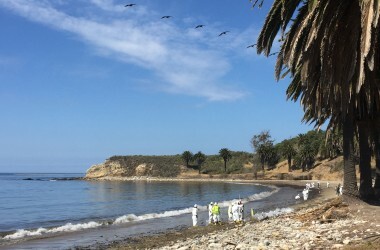 Oil washed out into the sensitive environment of the Santa Barbara Channel, threatening endangered whales, closing Refugio and El Capitan State Beaches, shutting down commercial fishing grounds, and harming still unknown numbers of birds and marine mammals. The spill eventually spread 150 miles down the California Coast, impacting beaches and communities as far south as Redondo Beach. These waters are known as the Galapagos of North America, with numerous species of endangered whales migrating through marine protected areas, pristine beaches, and an iconic coastline that supports a thriving tourism and recreation industry. In the wake of the terrible 1969 Santa Barbra oil spill, our communities fought for many years to protect this as one of the most important environments in all of California. To see our coastline damaged by yet another oil spill has united this community in sorrow and the intense desire to take action. Unfortunately, this is not simply a question of one faulty pipeline; this is the reality of the oil industry. With oil development, it is not a question of if, but of when, another accident will occur. While the cleanup has progressed, EDC staff have been working around the clock, supporting new laws and regulations to prevent future spills and ensure more immediate spill response. Prevention is key, since only about 10-15% of oil that spills into the ocean will ever be recovered. We are also participating in the Natural Resource Damage Assessment (NRDA) process to ensure full restoration to the coastal environment that was harmed as a result of the spill.